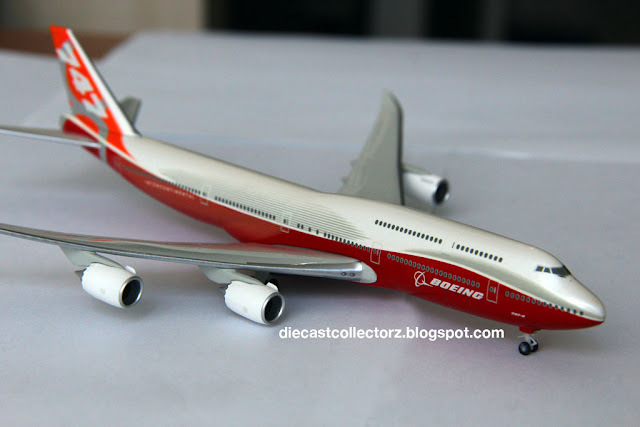 I was able to visit the brick-and-mortar Boeing Store in St. Louis, MO a few weeks ago and the model I picked was the Boeing 747-8 Intercontinental with the Boeing sunrise livery. The 747-8I was a derivative of the 747-400 but has a longer fusilage. It is the largest 747, largest passenger aircraft built in the United States and at 250 ft 2", the longest passenger aircraft in the world . Note: has spinning engine fans.